He’s baaaaaack—that rumple-headed, slovenly, ill-kempt little boy known as Struwwelpeter. Dover Publications presents the German morality poems of a century and a half ago translated into English with the original delightful drawings by Heinrich Hoffman. 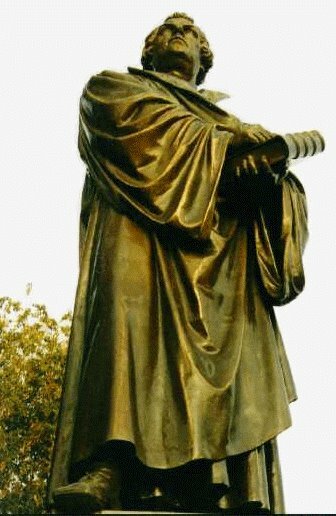 The original German text by Hoffman is included in the appendix. 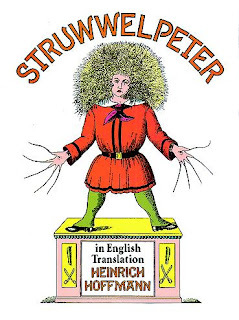 Der Struwwelpeter was one of my childhood books when I lived in housing like those above. Hoffman’s tale of Johnny Head-in-Air was one to take seriously if I wanted to dodge the gifts of the sheep after they’d been through the valley, our favorite playground. I didn’t care much for Conrad’s demise. I began reading Der Struwwelpeter when I was five, and the sight of a child with his thumbs whacked off was discomforting. Harriet’s final hours suited me no better. Boys, leave the black-a-moor alone! He cannot change from black to white. Surely concession, if not understanding, can be made to Hoffman for his use of “black-a-moor,” for he means no insult to race by it. The young child referred to is simply a black Moor, and Hoffman’s era was not so very politically correct in language as our own. What is important is the lesson he teaches about teasing and verbal abuse. One of these books from Dover Publications remains at home with me. The other is in my classroom where I introduced it to my students. At first they looked at the pictures and delighted in the gore. This is a generation hooked on Freddy and Jason, the Texas Chainsaw Massacre, and all manner of torture and mayhem without a reason even at a very young age. However, the purpose of fairy tale and morality stories is not gore and gruesome for its own sake, but to do the work of the Law in us. With very little coaxing, these well-catechized children were soon finding the Ten Commandments in the poetry of Dr. Hoffman. 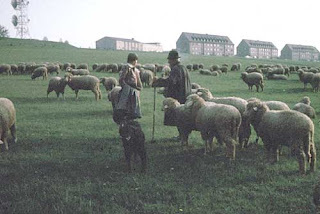 “Conrad should have listened to his mother. That’s Fourth Commandment.” “Harriet burned herself… Augustus won’t eat… that’s Fifth Commandment.” When the Law has its way with us, the Gospel can then have us by the ears. Morality stories have a place in Christian libraries for this reason.